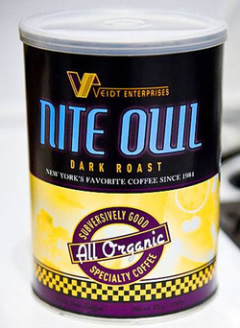 Watchmen fans will be all a-squee over this particularly subtle bit of cross-branding — the official product description points out that the character Nite Owl serves Veidt Enterprises' Nite Owl Dark Roast to some civilians he's just saved from a burning tenement building. The non-geeky among us will simply have to content themselves with a delicious roast, in which "flavors of ripe tropical fruit and rich cacao open up to complex spice with vanilla and sweet tobacco notes in this beautifully balanced cup. The luscious, creamy body will linger sweet and seductively on the tongue to keep you wanting more, morning and especially night."